Leo’s story is a common one, and one we hear all too often. From the information we’ve received, Leo was purchased by a Minnesotan last winter as an exotic pet. 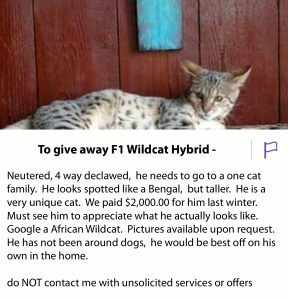 Even though it’s illegal to own first through third generation hybrids (F1-F3) in the state of Minnesota, that isn’t why Leo made his way to our Sanctuary. Instead, it was behavioral issues. Leo, like most hybrids, wasn’t consistently using the litter box in the house and he was also aggressive to the owner’s other animals. Therefore, his owner placed a “free to good home” ad on the local Craigslist. 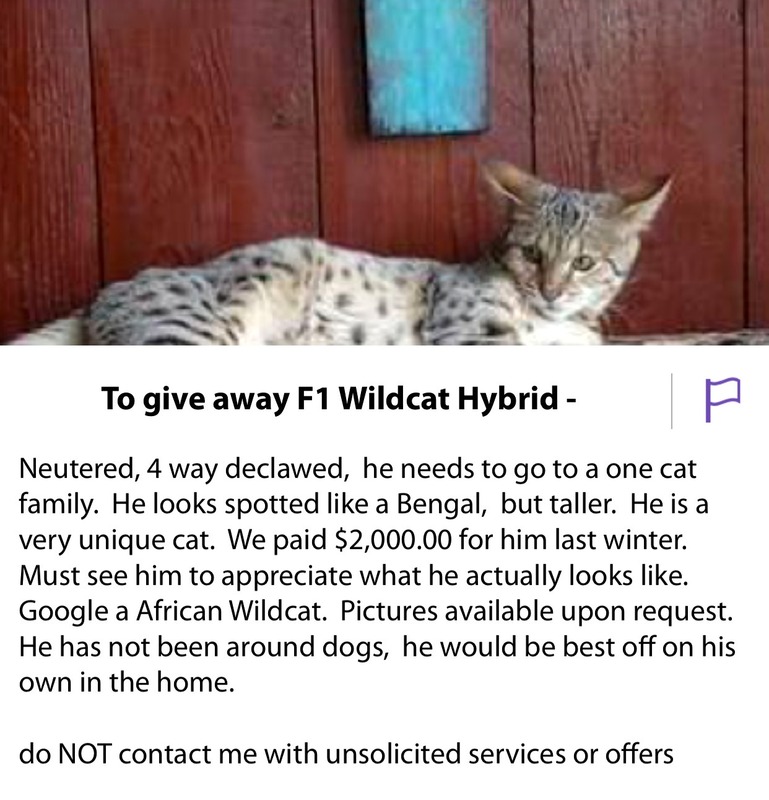 An individual who always wanted a Bengal or hybrid cat answered the ad. She was very excited to welcome such a unique cat into her home. When she arrived to pick-up Leo, he was being kept in a cage in the garage. She was informed that he had been 4-paw declawed earlier that month as an adult cat. Several medications were prescribed for the first owner to try to help with his diarrhea. On top of that, medication for ear mites was also prescribed. It appears very little of these medications were administered since they were given to the new owner along with Leo. needs could be met so she contacted The Wildcat Sanctuary. Leo owes his new lease on life to her. behaviors and common medical issues. He’s adjusting quickly to his new home with us and all the love that is being showered on him. 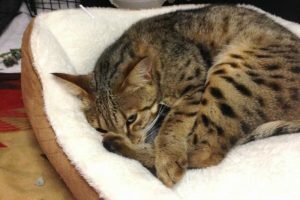 Our vet is performing thorough tests to make sure we understand the cause of his chronic diarrhea and we are transitioning him to a more appropriate diet for a hybrid wildcat. 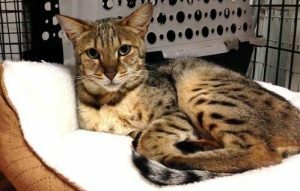 We hope Leo has a long and healthy life ahead of him here with those who understand the challenges and special needs hybrid cats face. He is finally at a place where he can be who he is, without fear of being abandoned or punished. It would mean so much to Leo if you’d like to help provide for his veterinary and daily care by becoming his sponsor parent HERE.